Anessa Quilt bedding by C&F Enterprises - P.C. Fallon Co.
Lowest prices all the time, guaranteed! If you find a better price, let us know. 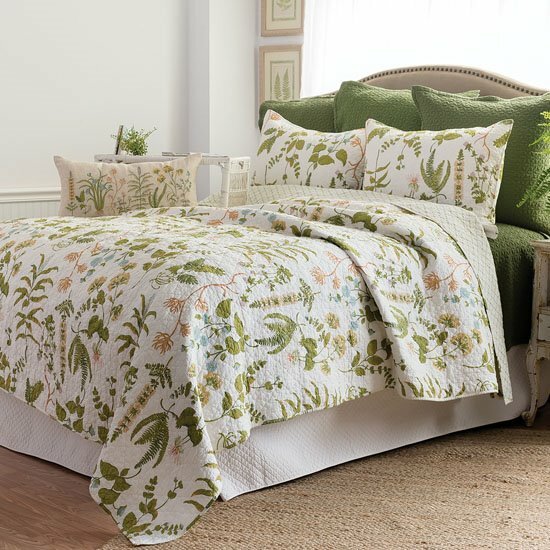 Anessa Quilt bedding by C & F Enterprises is a garden inspiration of ferns, flowers, and plants in greens and a touch of pale blue lavender, and tan on an ivory background. Self binding trim at edges. The reverse of the quilt is a green trellis pattern on ivory. Cotton Filled, Prewashed, Luxury Oversized. A bedskirt in solid cream quilted in a grid pattern sets off the garden print quilt. Euro shams are offered in a coordinating solid fern green with a geometric floral quilt pattern. 100% cotton and machine washable. An embroidered pillow picks up the plants and colors of the quilt for additional accent. Pillow is spot clean only. Anessa Full Queen Quilt has ferns, flowers, and plants in greens and a touch of pale blue, lavender, and tan on an ivory background. Cotton Filled, Prewashed, Luxury Oversized. 90" x 92". Fits full and queen size mattresses. Self binding trim. The quilt reverses to a green trellis pattern on white. We offer the complete ensemble in the Anessa pattern by C & F. Manufacturer's Id number is 008246326915. Anessa King Quilt has ferns, flowers, and plants in greens and a touch of pale blue, lavender, and tan on an ivory background. Cotton Filled, Prewashed, Luxury Oversized. 108" x 92". Self binding trim. The quilt reverses to a green trellis pattern on white. We offer the complete ensemble in the Anessa pattern by C & F. Manufacturer's Id number is 008246326922. Anessa Standard Sham has ferns, flowers, and plants in greens and a touch of pale blue, lavender, and tan on an ivory background. 20"H x 26"L. We offer the complete ensemble in the Anessa pattern by C & F. Manufacturer's Id number is 008246326939. The Manchester Fern Euro Sham Set of 2 is a solid fern green quilted in a geometric Flower of Life pattern. 26"H x 26"L. Designed to be used behind a standard sham. Manufacturer's ID number is 008246327073. Cream Quilted Queen Bedskirt is solid cream with a quilted grid design. Tailored, split corner, 18" drop bedskirt. 60"W x 80"L. Manufacturer's ID number is 008246326946. Cream Quilted King Bedskirt is solid cream with a quilted grid design. Tailored, split corner, 18" drop bedskirt. 78"W x 80"L. Manufacturer's ID number is 008246326953. Anessa Embroidered Pillow has ferns, flowers, and plants embroidered in greens with pale blue, gold, and pink on a natural color background. 12"H x 24"L. We offer the complete ensemble in the Anessa pattern by C & F. Manufacturer's Id number is 008246327769.